Yall. I don't know this lady (with the long hair) at all. I've never seen her in my life. But. She literally just brought tears to my eyes. 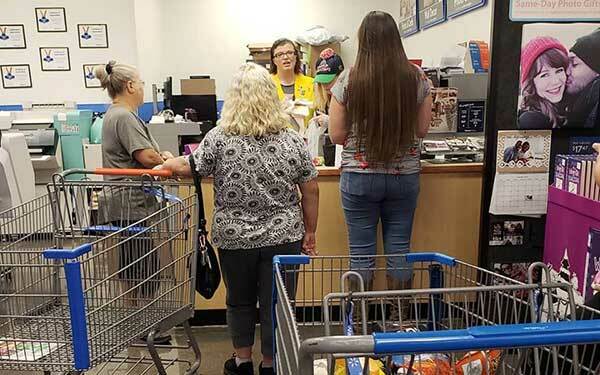 The two little ladies standing beside her was tryint to put something on layaway for Christmas, but didn't have enough money to cover the layaway price ... and their medicine they need. So, they just told the cashier not to worry about it, and maybe they could come back when they don't have to buy their medicine. The lady walked up to the cashier, and offered to pay their stuff in full so they can have Christmas for their grandchildren. The two older ladies (sisters) started to cry and told her they didn't know how to repay her. She put her arms around them, and said... "You don't owe me anything. I'm just trying to live a life that shows people Jesus is alive, and He is real.". Yall. I am so thankful I got to witness this. The good samaritan at Walmart Cleveland was not identified as nobody in the comments section mentioned her name. As of November 20, Ramirez' post already garnered nearly half a million reactions, over 148,000 shares, and 28K comments on the social media site. Most netizens said they love to see and do random acts of kindness while others said the good samaritan at Walmart is an "angel" sent by Heaven to Earth.